A man in southern Florida has been arrested in connection with the suspected pipe bombs that were sent this week to political figures including Barack Obama and Hillary Clinton. “We can confirm one person is in custody,” Sarah Isgur Flores, a Justice Department spokeswoman, said on Twitter. The suspect is in his 50s, has an address in the city of Aventura and also has ties to New York, according to reports. The man was arrested at an auto parts shop in Plantation. Federal agents were removing a vehicle from the location after the arrest was announced. Jeff Sessions, the attorney general, was scheduled to hold a press conference at 2.30pm on Friday. Sessions was briefing Donald Trump at the White House after two more suspicious packages, addressed to a Democratic senator and the country’s former intelligence chief, were discovered earlier on Friday, bringing the total to 12. The newest packages were sent to Senator Cory Booker of New Jersey and James Clapper, the former director of national intelligence. Suspected pipe bombs were previously sent to eight other prominent critics of Trump. None exploded before being found and no injuries were reported. Shortly before the arrest, Trump complained that the series of attempted bombings was damaging his party’s prospects for next month’s midterm elections. He also appeared to stoke conspiracy theories about the authenticity of the explos. “Republicans are doing so well in early voting, and at the polls, and now this ‘Bomb’ stuff happens and the momentum greatly slows - news not talking politics. Very unfortunate, what is going on. Republicans, go out and vote!”, Trump said. The president had also complained in a 3am tweet that he was being unfairly blamed for the attempted bombings. Sessions said at an event in Washington earlier on Friday morning that federal agents were “working tirelessly” to catch the sender of the packages. “I can assure you that we are dedicating every available resource to this effort,” said Sessions. Investigators searching for the sender were on Thursday night focusing on a postal sorting facility in Opa-locka, outside Miami, which authorities said the packages may have passed through. Investigators were drawn to the region by US Postal Service records and were examining forensic evidence on the packages. Matching envelopes, containing what appeared to be pipes packed with explosives and connected to wires, were discovered across the US over the past week, in what authorities described as a campaign of domestic terrorism. Secret Service that were addressed to the homes of Obama, the former president, and Clinton, the former secretary of state. Over the following days packages were found addressed to the former vice president Joe Biden, the former attorney general Eric Holder, the former CIA director John Brennan, the Democratic congresswoman Maxine Waters and the actor Robert De Niro. All are high-profile opponents of Trump. The package addressed to Booker was intercepted in Florida while the one for Clapper was discovered on Friday morning at a post office in the Hell’s Kitchen section of Manhattan. It was addressed to Clapper at the offices of CNN, a few blocks away, where he is employed as an analyst. CNN’s Manhattan offices were evacuated on Wednesday when another suspected pipe bomb was sent there, meant for former CIA director John Brennan. Both former intelligence officials have been outspoken critics of Trump’s actions in office. Clapper on Friday said the packages were part of campaign of “domestic terrorism” intended to sow fear and intimidate people. Clapper praised the FBI for its work on the investigation and for persevering in the face of abuse from the president. Trump has accused the FBI of being involved in a “deep state” conspiracy to undermine him and of botching an inquiry into private email server used by Hillary Clinton. “Will the FBI ever recover its once stellar reputation?” Trump asked in a tweet in August. The governor of New York, Andrew Cuomo, said Trump’s reaction to the attempted attacks was “wholly inappropriate” and showed he had “never fully made the transition” to being presidential. “Am I hopeful that the zebra changes his or her stripes today? No,” Cuomo said on CNN. 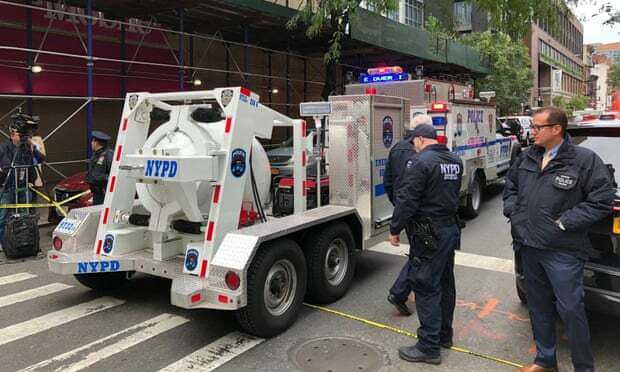 A suspected pipe bomb was also discovered at the offices of the De Niro in lower Manhattan on Thursday. The actor received a standing ovation at the Tony awards in New York in June for a speech criticising the president.